Therminol D-12 is a synthetic liquid-phase heat transfer fluid with excellent heat transfer properties over a wide temperature range. This fluid is ideally suited for applications requiring efficient cooling and heating. Product availability: Globally. Contact your local sales representative for more information. Heating or Cooling Operation—Therminol D-12 is ideally suited for combination heating and cooling applications and delivers excellent heat transfer rates even at -45°C (-50°F). 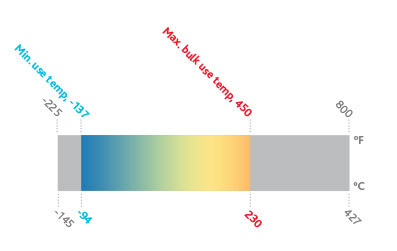 Batch processes will benefit from the excellent cooling performance Therminol D-12 delivers. Therminol D-12 also may be used as a secondary coolant or "brine" in refrigeration loops where a broad range of properties is desired. Easy Operation—Using Therminol D-12 avoids problems of using multiple fluids in the same piece of equipment. Low Cost—Therminol D-12 delivers better thermal performance at lower cost than competing fluids. Low Odor and Excellent Toxicity Profile—Therminol D-12 is NSF registered with HT1 status, surpassing requirements for use where there is the possibility of incidental food contact.